Synthetic peptide. This information is considered to be commercially sensitive. ICC/IF: Post-natal rat pup (PND1) heterogeneous brain cells. WB: Post-natal rat pup whole brain lysate (PND2-6)* and rat pup PND2-6 – minimal cortex brain lysate. 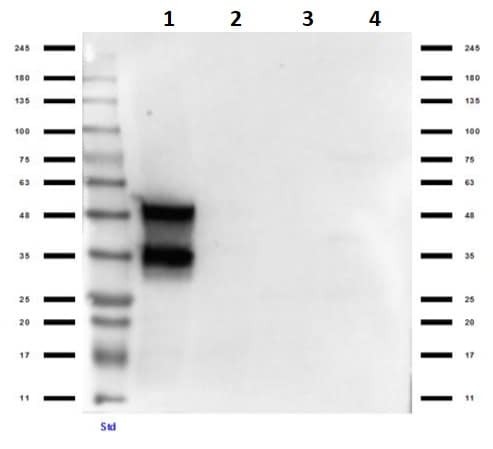 Doublecortin (human) overexpressing HEK-293T lysate C-Myc/DDK tagged. IHC-P: Mouse dentate gyrus tissue. Human brain tissue. Our Abpromise guarantee covers the use of ab235153 in the following tested applications. IHC-P 1/1000. Perform heat mediated antigen retrieval before commencing with IHC staining protocol. WB 1/1000. Predicted molecular weight: 49 kDa. ICC/IF Use a concentration of 15 µg/ml. 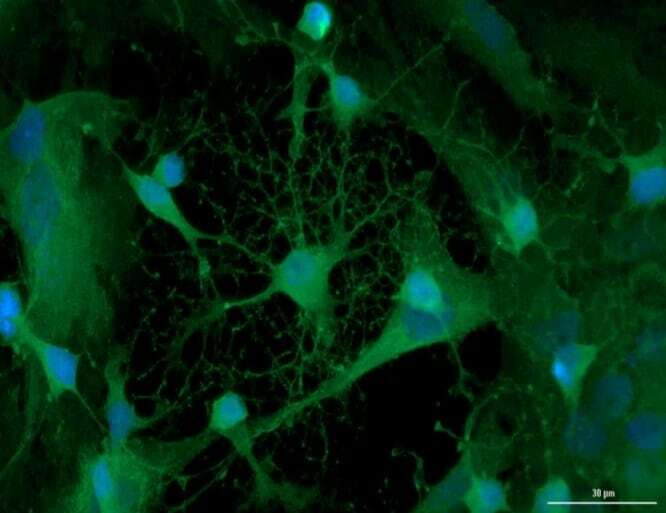 4% PFA fixed, 0.3% Triton X-100 permeabilized post-natal rat pup (PND1) heterogeneous brain cells labeling Doublecortin using ab235153 at 15 µg/ml (O/N at 4°C) (green) in ICC/IF.The Secondary antibody is a Donkey anti-Gt IgG DyLigh™ 488 conjugated preadsorbed antibody, used at 5 µg/ml for 1 hour at room temperature. The Nuclear counterstain is DAPI (Blue). * "Doublecortin microtubule affinity is regulated by a balance of kinase and phosphatase activity at the leading edge of migrating neurons." Schaar B.T., Kinoshita K., McConnell S.K. Neuron 41:203213 (2004). Minimal cortex defined: small portion of cortex removed prior to lysis. Formalin-fixed, paraffin-embedded mouse dentate gyrus tissue stained for Doublecortin with ab235153 at a 1/200 dilution (30 mins at room temperature) in immunohistochemical analysis. 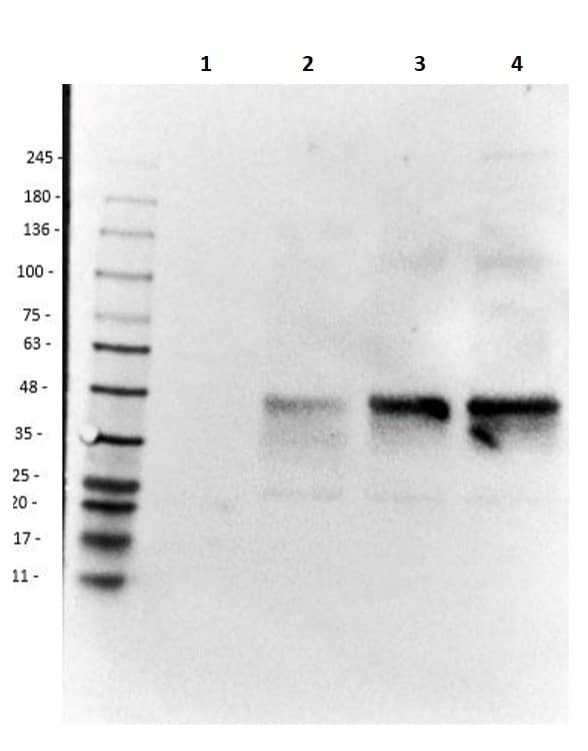 A Donkey anti Goat (HRP) secondary was used at 4 µl/ml (20 mins at room temperature). Counterstained with hematoxylin. HIER using citrate buffer for 20 mins. 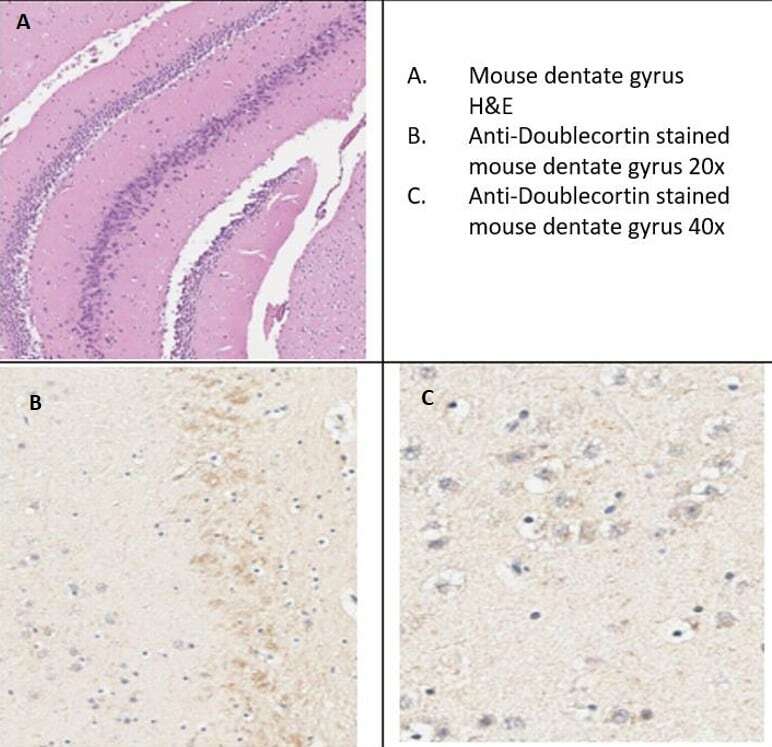 Pathologist analysis: Doublecortin (DCX) showed selective staining of soma and nuclei of cells in the dentate gyrus in mouse brain. The specificity of the staining is consistent with DCX staining in the Human Protein Atlas and as such, is suitable for IHC at a concentration of 1/200. 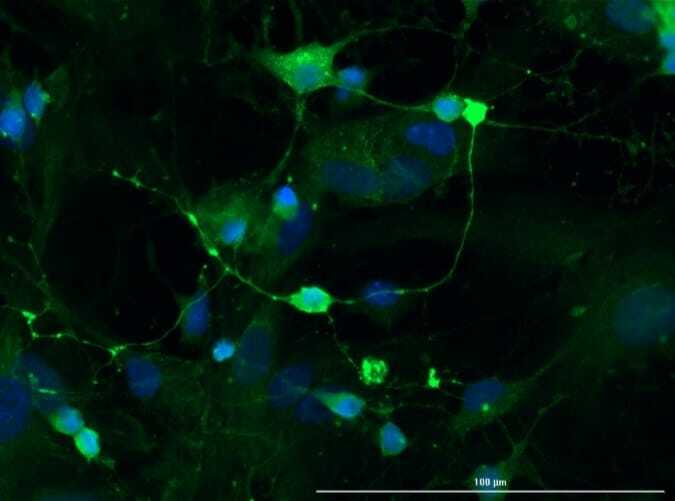 4% PFA fixed, 0.3% Triton X-100 permeabilized post-natal rat pup (PND1) heterogeneous brain cells labeling Doublecortin using ab235153 at 15 µg/ml (O/N at 4°C) (green) in ICC/IF. The Secondary antibody is a Donkey anti-Gt IgG DyLigh™ 488 conjugated preadsorbed, used at 5 µg/ml for 1 hour at room temperature. The Nuclear counterstain is DAPI (Blue). Observed band size: 48, 35 kDa why is the actual band size different from the predicted? Human brain tissue stained for Doublecortin using ab235153 at 1/1000 dilution in immunohistochemical analysis. The counter stain is hematoxylin. Heat induced epitope retrieval (HIER). ab235153 has not yet been referenced specifically in any publications. Publishing research using ab235153? Please let us know so that we can cite the reference in this datasheet. There are currently no Customer reviews or Questions for ab235153.